Yesterday morning I used my Ring of the Kirin Tor to start the Daily Rare Hunt (TM) Having been told by a Guildie (waves at G) that he’d killed Vyragosa on Thursday I was aware this meant there was a chance the Time Lost Proto Drake had spawned overnight and was still active. As I was doing my first circuit around the Storm Peaks I noticed a new nameplate literally appear beneath me on the mini map as I flew past. I named him Blue, with a nod to the kids TV character of the same name that my son loved so much growing up, and because he is. Once I’d reassured myself that there were no more rares in the Peaks that could either be a) tamed or b) poked at with sticks I decided I’d go check if Icehorn was up, via flying over Arcturis’ spawn spot in Grizzly Hills… well, just in case. My favourite. After all, every Dwarf loves a bear.. 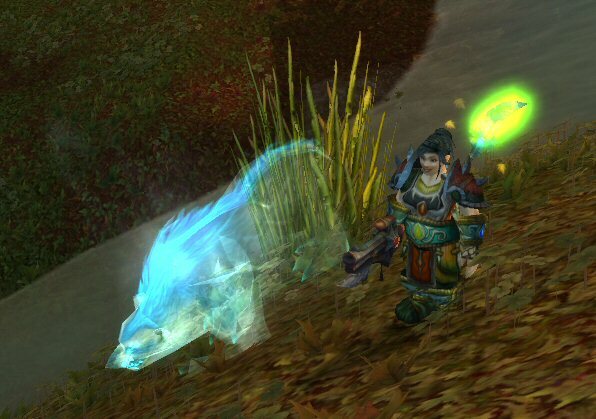 I nearly fell over myself taming Adams (I like it) and of the now full-set of Northrend Spirit Beasts I own in just under a week this will be the one that stays in the permanent pet bar. Knowing that I am not the luckiest person in the world when it comes to mobs I can only conclude that since Cataclysm the spawn rates for rares generally are up. This is therefore probably a good time to be hunting Spirit Beasts.